You've got the dominator. Or two. The silent student. Or ten. The thoughtful contributor. The doodler. The one who has always got a related story that's not really relevant, and the one who just can't help but interrupt. As English teachers, we rely on discussion. But no matter how many styles we might try - socratic seminar, literature circles, Harkness, fishbowl, small groups - there's a certain issue we are always going to run into. Discussion dynamics. Who will talk and who won't? Who will listen and who won't? Who cares enough to try to refer to the text? Who loves other subjects enough to try to make connections across disciplines? By the time our students reach us, they often consider their discussion roles to be set. They know what they feel comfortable with, and it takes a lot of oomph to pull them out of their past ruts. Some students got shut down early by negative reactions from peers, some students have so much confidence they believe no one else has as much to say, some students come from cultural backgrounds that promote listening over speaking for young people. 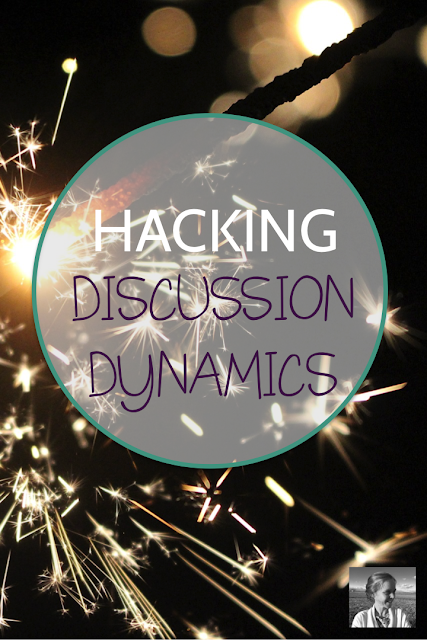 For me, conscious discussion of discussion dynamics is one of the most important keys. It's the thing I love about the Harkness discussion method (which you can read all about right here). But not everyone has the time or inclination to cleave to the Harkness method. 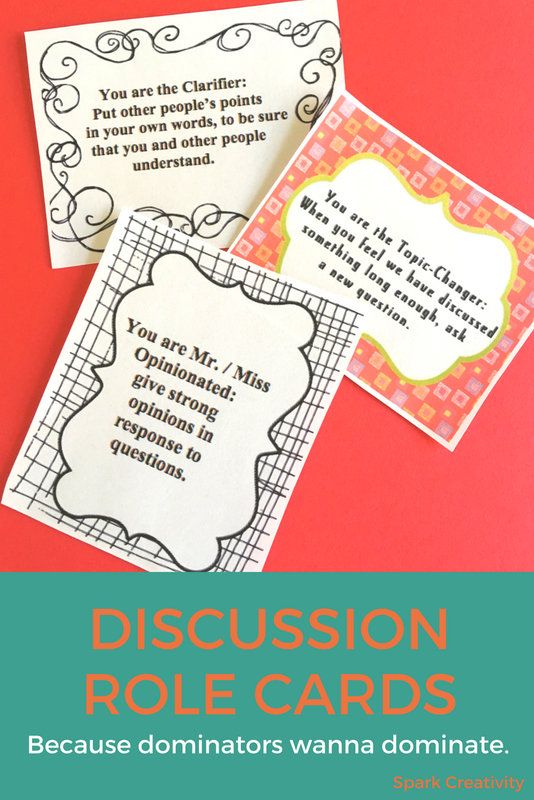 Another way to cut through discussion ruts and help students to change up their roles is to create discussion role cards. Brainstorm a list of ways students can participate in positive ways. You can even let them help. Students can make connections between points. Students can play devil's advocate, forcing other students to clarify and back up their opinions. Students can share their opinions. Students can connect the text to things going on in world news or politics. Students can connect the text to history. Students can connect the text to modern music, television, or film. Students can help draw out students who get shut down or interrupted. Students can listen and make eye contact with speakers. Students can ask penetrating questions. Students can be careful to use text in supporting their statements. Students can help the class move on when the discussion is stuck for too long. Students can be peacemakers between participants getting too heated. Once you have established the types of roles you'd like students to work on, you can type them up as small cards that you can print out for every student. If you're a laminator, go for it! If not, just cut them out and have them ready for your next discussion. Now, you have a decision to make. You can either personally match each role with a student you'd like to see work on that role, or you can leave it to fate. Personally, I just tape the cards under everyone's desks at random, then ask them to pull them out and keep their roles ABSOLUTELY SECRET during the discussion. The secrecy is half the fun. Having a mandated role helps students feel a bit of obligation to try something new, and it also gives them courage to do so. As the discussion progresses, they realize that the others around them are not stuck in one single role either. Dominators get a chance to see quiet students making crucial connections. Interruptors are so busy trying to play devil's advocate that they don't interrupt. Clock-watchers are busily trying to notice who is getting shut down and draw them out. Another fun twist is to add a few startling questions to the roles. For example, make a student's role suggesting that a political book is "too political" for the classroom and see what happens. 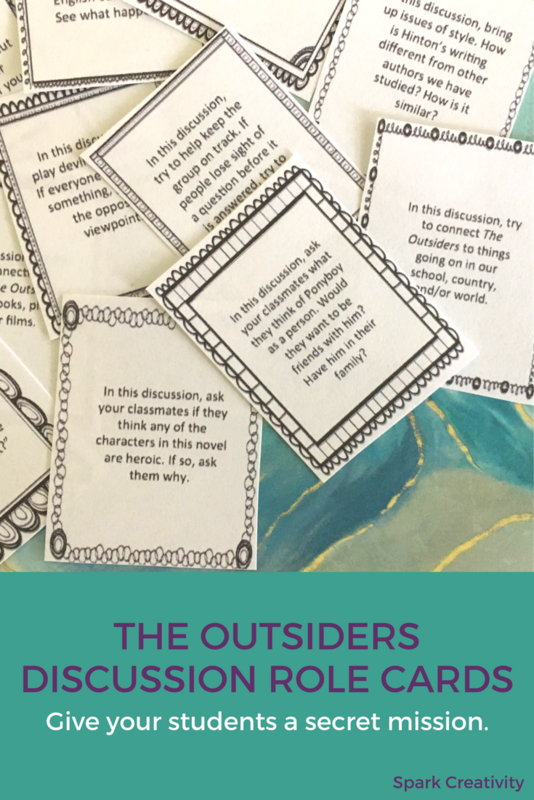 In the discussion role cards I made for The Outsiders, I tried to sprinkle in several questions that would help students explore their feelings about the novel, as many connect to it on a deep level. 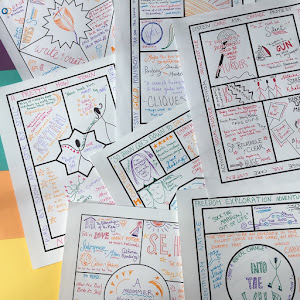 When you complete the discussion, give students a few minutes to reflect on paper about their roles. How did the experience change the way they view their own participation? How did it change the way they view others' participation? Chances are, they will see things a bit differently going into the next discussion. And if you continue to hand out roles now and then, you will continue to challenge students' natural inclinations and help them grow. After the written reflection, if you have a few minutes left, let them talk about the experience as a group. Pressed for planning time? If you don't want to make your own discussion role cards, I've created a variety of them for my TPT store. I'm giving them away right now (3,000 copies so far!) so you should hurry over and pick them up. A recent reviewer wrote "What a fantastic idea! I can't wait to try these with my students. What a great way to get them excited and involved!" When you pick them up, you might want to follow along with my store so you get notified when I create freebies like these and other great resources for your creative classroom endeavors. If you're looking for a more novel-specific set of cards, I've also created them for 1984, The Outsiders, Harry Potter, and Into the Wild. I hope trying out role cards will help you teach your students that they aren't stuck in any one way of participating. It's a lesson that can make a real difference in their lives, in school and beyond.